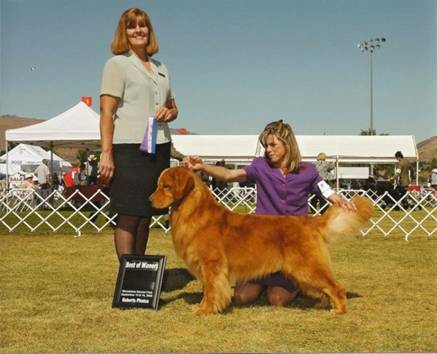 Bola is an honoray guest at Garnev Golden Retrievers. 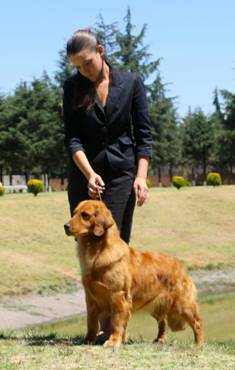 He is a dog with excellent movement, conformation and temperament. Bola conquered the rings in Brazil obtaining several championships: Young Brazilian Champion, Brazilian Champion, Great Brazilian Champion, just to later obtain his title of American Champion. In his short stay with us, Bola added to his list the titles of Mexican Championship and Sicalam Winner 2010. Kelly and Bola are the perfect combination! Kelly has always captivated us with his sweetness and beauty in show. Her rich color and movement always make her shine in the beauty show. Without a doubt, this will be an extraordinary litter.